Blancmange is a British pop-duo formed in London in 1979. 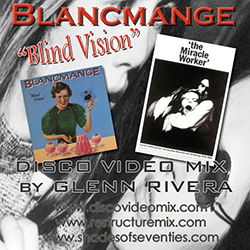 Their big dance hit from 1983 “Blind Vision” is one of the tracks that topped my clubs Top 10 for several months. It is from their album “Mange Tout” and features Jocelyn Brown on backing vocals. Although the group produced an alternative synth sound – it was closest to the high energy/disco pop of the 80s and created quite a stir on these dance floors. I have taken the single and blended it with the 1962 biographical film “The Miracle Worker” – based on the 1902 autobiography of Helen Keller – the film’s stars Anne Bancroft (Academy Award for Best Actress 1962) and Patty Duke (Best Actress Award) – the film deals with Helen Keller who is born blind and deaf and the battle to teach her to communicate with sign language. The scenes are quite sensitive and although the song bears only words that connect it are intended to support human hope and knowledge to make us better. Featuring scenes from “The Miracle Worker” – RENT THE DVD!